This 2-week healing plan will assist you in clearing your thinking patterns that create a lack of money. Your negative and fearful thoughts around money are the primary blocks that keep you from being successful in creating an increase of money flowing into your life. By clearing old energy from your mental and emotional energy fields, you will more easily be able to change any negative thinking to positive thinking about money. At the end of this 2-week healing plan, you will be well on your way to creating a positive thought process and perception of money, which allows more money to flow into your life. 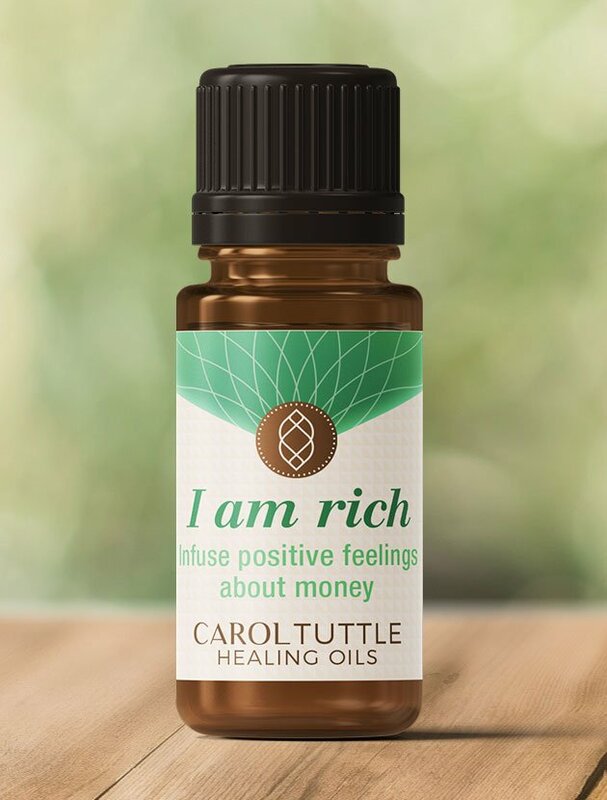 The oil customized to support you in this Healing Plan: I am rich. Listen here or download and listen on the go. This audio session will help train your mind to think about money differently. Listen here or download and listen on the go. Listening to these powerful affirmations will help you shift your subconscious and conscious beliefs about money. You have inherited many limiting beliefs about money from your family and ancestors. These affirmations will assist you in forming your own belief system about money. Sound healing, using Tibetan healing bowls, helps you process, clear, and ground your energy. They activate your energy centers to help you express your true self with more ease. Listen to this track while you set your daily intention, go on a walk, or as you fall asleep at night. You are not the author of the limiting beliefs about money held in your subconscious and conscious mind. Those beliefs were handed down to you from parents and ancestors. This session will help you clear those patterns so you can create your own affluent experience. Stage 1 is your first stage of life between 0-6 months old, when you need to know you are loved. At this time, you can take on a strong imprint that you are not worthwhile or have to do something to create your worth. This session will assist you in clearing this energy that transfers to your relationship with money. Your energy is like a container and you have conditioned your energy to only contain the amount of money you are currently experiencing. This visualization will assist you in enlarging your energetic container, preparing you for larger sums of money to flow to you and accumulate. Money easily and effortlessly flowing to you from expected and unexpected sources. Money raining down around you. Focus on your breathing. As you inhale, picture your energetic attraction to money increasing. As you exhale, picture it flowing out. Notice more money flowing in than out. Hold some dollar bills while listening to the sound of the Tibetan Healing Bowl and imagine that money is always there for you. It is your friend and support. Thank money as you feel it, smell it, and connect your energy to it while you do this meditation. Watch each of the 4 healing sessions below at least one time. Watch sessions twice if you have time, or again at any time that they would be supportive. Each day of this week, continue to do the 3 practices under the “Daily” tab. The repetition of this session from last week will support you. Watch and let things go. Between 13-18 years old, you prepare for creating a successful adult experience. Think back to this time in your life: what was your experience with money? What were your family experiences with money? When you do this session, set the intention that you will clear the energy you still carry surrounding money from that stage of your development that is causing you stress. As you clear the stressful energy, you free your mind to think positively about money. This audio training teaches you how to call on angels to assist you in creating desired outcomes. Ask your angels to make you aware of any negative thinking you have about money. As you become aware of limiting thoughts about money, change them to the positive thoughts and statements you are learning from the Daily Script and the Daily Affirmations you have been listening to. Write some of your favorite positive thoughts on 3×5 cards and tape them in visible places to remind you throughout the week. The dashboard of your car is a great place. Use this technique to connect your energy with the energy of money. Inspires positive thinking about money. Releases anxiety and stress about personal financial situations. Insight: Insight helps you move beyond limitations regarding money and power. It grants insight into both your financial situation and the true meaning of wealth. Lapis Lazuli: Lapis Lazuli harmonizes your heart and mind as it forges stronger bonds between them. With heart and mind working in harmony, mastery of any area of life becomes more attainable. Lapis Lazuli empowers you to envision, and then live your dreams with vitality and a fearless, adventurous spirit.